Dried seed cones, commonly known as „juniper berries“, are used as spice in European kitchen, especially for venison and sauerkraut (sour cabbage). There are juniper-flavored distilled beverages like gin and wacholder. 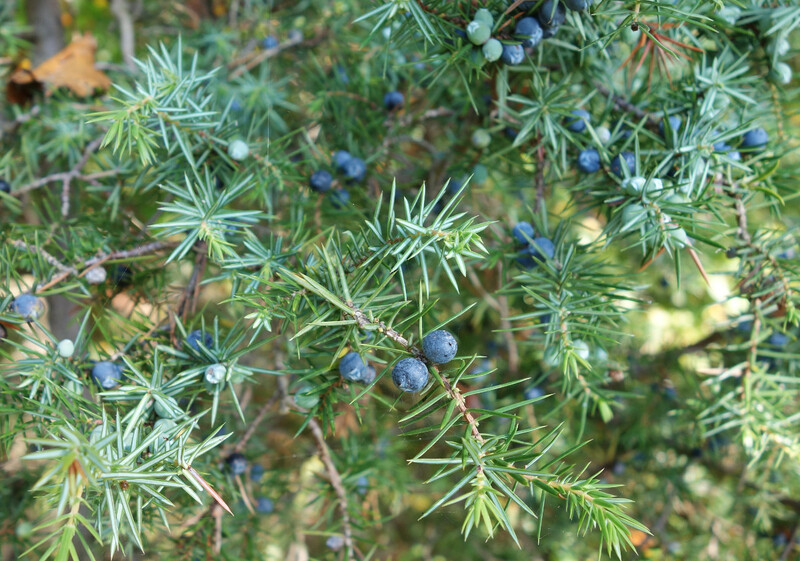 The main monoterpenoids (representing 70% of the sample’s volatile fraction) detected by SPME in the headspace of juniper berries were terpinen-4-ol (22.5-30.6%), p-cymene (7.58-13.5%), β-myrcene (10.6-11.3%), ɣ-terpinene (3.0-10.1%), α-pinene (8.5-13.4%), limonene (4.4-5.9%) and α-terpinene (1.3-4.2%). Main sequiterpenoid was δ-cadinene (3.9-5.9%). Cis-rose oxide was found only by SPME (0.11-0.18%) but not not in SDE. Main components of an industrial essential oil from the branches were α-pinene (18.7%) and thujopsene (25.3%). Minor constiuents were monoterpenes like α-thujene, α-pinene, sabinene, terpinen-4-ol, α-terpineol, α-terpinyl acetate, and sesquiterpenes like α-cedrene, β-cedrene, cuparene, cedrol, β-caryophyllene, α-humulene, germacrene D and δ-cadinene e.g. The root oil of Juniperus communis subsp.alpina showed a very special composition of sesquiterpenes with cedrol (37%), longifolene (11%), longiborneol (8%), α-cedrene (6%), nootkatone (3%), β-cedrene (1.4%), thujopsene (1.1%) and valencene (1.7%).